In Matthew McConaughey’s underrated performance of Denton Van Zan in Reign of Fire, he implores everyone to face the reality of a post-apocalyptic world by stating, “Look out the window. Eden isn’t burning; it’s burnt.” A more fitting quote to describe the Rockies there is not. The 2015 season for the Colorado Rockies is over. And the sooner Jeff Bridich embraces that simple fact, the sooner he can go about rebuilding for the future. Prior to the start of Colorado’s season, there was optimism that this year could be the year. Troy Tulowitzki and Carlos Gonzalez were going to stay healthy. Young guns Nolan Arenado and Corey Dickerson were going to round out the most dangerous lineup in the league. The Rockies were going to mash. Jorge De La Rosa was going to regain this form. Eddie Bulter and Jon Gray were going to find their way into the rotation and pitch lights out. And the bullpen was going to be much better. Optimism is one thing; blind optimism is another. 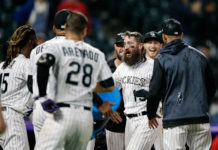 The Rockies had to have everything go right if they expected to compete, which hasn’t happened. They’ve been relativity healthy, but their bats have completely let them down. There’s no timely hitting to speak of and Gonzalez has been nothing short of pedestrian. The bullpen has been decent, but extremely overused, and the starting rotation has been a catastrophe. With no hope of salvaging the season, Bridich and Co. need to embrace losing, and fans should cheer for it. It’s time for the Rockies to hit rock bottom. Bridich needs to start by trading away his three biggest contracts. Fleece one of the New York teams for all of the top prospects in a Tulowitzki trade. Then, move Gonzalez for whatever you can get – considering that his batting average has been sub-.200 for a calendar year, that might not be much – and give De La Rosa away to the first team willing to pick up the rest of his deal. But that’s just the beginning. Justin Morneau isn’t going to be part of the future, so he needs to go. Charlie Blackmon and D.J. LeMahieu have been nice surprises, but they’re nothing more than role players that currently hold value. Gone. Wilin Rosario and Drew Stubbs should have been traded in the offseason. Time to rectify those mistakes. Who needs a disappointing first-round pick who has shown some promise as a middle reliever? Christian Friedrich is your guy. John Axford would probably like to play for a contender. I’m surprised he hasn’t asked to be traded. Which brings us to Arenado and Dickerson, maybe the only two players on this roster that are considered untouchable. Both are budding superstars in their mid-20s who are great building blocks. But is it really worth keeping these two? Let me tell you a story. Once upon a time (five years ago), the Colorado Rockies had an upcoming superstar shortstop in his mid-20s. He was heralded as a franchise savior and far to valuable to trade. Fast-forward to today and anyone with any common sense would agree that that superstar shortstop should have been traded years ago. The Rockies aren’t one or two years away from being contenders. If Bridich doesn’t move Arenado and Dickerson now, he’s going to end up in the situation he’s in with Tulowitzki (especially considering Scott Boras is Arenado’s agent). The hottest two prospects at 20th and Blake aren’t going to want to waste the primes of their careers with a meddling franchise the way No. 2 has. Trading Arenado and Dickerson will hurt the most, but it’s time to commit to hitting rock bottom. If the baseball gods have any mercy, the Colorado Rockies won’t win a game in the month May. That’ll undoubtedly be the straw that breaks the camel’s back for Tulo. He’ll demand a trade, and then the dominos can start to fall. Once Tulowitzki demands a trade, Bridich needs to publically state that the Colorado Rockies are open for business and detail he’s plan to deal everyone. Although asking Bridich to explain his detailed plan may be asking a lot. It’s time to cheer for every Rockies error, every disastrous outing and each strikeout because the truth is 20th and Blake isn’t burning, it’s burnt. It’s a pile of smoldering ashes and the sooner that brain trust realizes that, the sooner real change can (hopefully) happen.